Rodney Sorrell opened the new season by winning the Toyota Tundra Bassmaster Weekend Series, operated by American Bass Anglers, Virginia Division 19 tournament, held March 9, 2013, on Lake Gaston. Running out of Morningstar Marina in Littleton, N.C. to fish the 20,300-acre impoundment on the Virginia-North Carolina border, the Stokesdale, N.C., angler caught five bass weighing 18.63 pounds with a 5.91-pound kicker. For the Boater Division victory, Sorrell took home a check for $2,317.Sorrell pulled the big bass out of the cold, stained water with just 10 minutes to spare. He stayed shallow, fishing jigs and crankbaits. He caught a total of nine keepers. In second for the boaters, Josh Wagy of Dewitt, Va., brought in four bass weighing 12.89 pounds. He fished with Otis Darnell of Linden, Va., in a boater-on-boater draw. Darnell landed four bass weighing 11.82 pounds for third place. In fourth place among the boaters, Todd Sumner of Southern Pines, N.C., landed a five-bass tournament limit weighing 11.68 pounds. 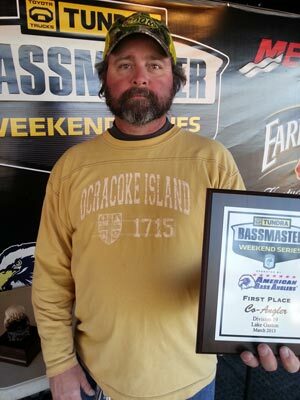 James A. Funk of Portsmouth, Va., took fifth place with three bass at 11.11 pounds. Joel Eberts of Powhatan, Va., landed the tournament big bass, a 6.14-pounder to take home $250. As the Royal Purple Rewards winner, Eberts also earned a case of Royal Purple oil, a quart of Royal Purple Max Gear Lube, a Royal Purple hat, one entry fee for a future BWS tournament and a one-year extension to his membership. In the Co-Angler Division, Dean Gibbs of Richmond, Va., landed a three-bass division limit going 9.49 pounds. He anchored his catch with a 4.30-pound kicker. For the victory, Gibbs pocketed a check for $1,080. He caught all of his fish on crankbaits fished in shallow water. Travis Bass of Middlesex, N.C., took second among the co-anglers with two bass at 6.94 pounds. Robert A. Morris of Roanoke, Va., finished third with two bass and 5.80 pounds. David L. DeCiucis of Richmond, Va., and William C. Vaughn of Raleigh, N.C., tied for fourth place. Each landed one bass weighing 5.58 pounds. They also tied for bringing in the largest bass in the Co-Angler Division. Each angler earned $54 for splitting the lunker pot. John Faircloth of Clayton, N.C., finished in sixth place with two bass weighing 5.25 pounds. For more information on this tournament, call Gary Conner, tournament manager, at 256-230-5627 or call ABA at 256-232-0406. On line, see www.americanbassanglers.com.